In a large bowl mix together all ingredients. In a small pan, test cook a portion of the mixture and test the seasonings. If you think it needs more of anything add it. Roll meat into large(ish) balls and place on cookie sheets. Process all ingredients up to bacon fat together in a food processor or Ninja until it’s the coarseness you want it. Add liquids to adjust as needed. Heat bacon fat over high heat, add in the paste/sauce mixture and cook sauce until bubbling and fat gets absorbed. Add in ginger, orange zest, vinegar and orange juice until sauce has the consistency you would like. 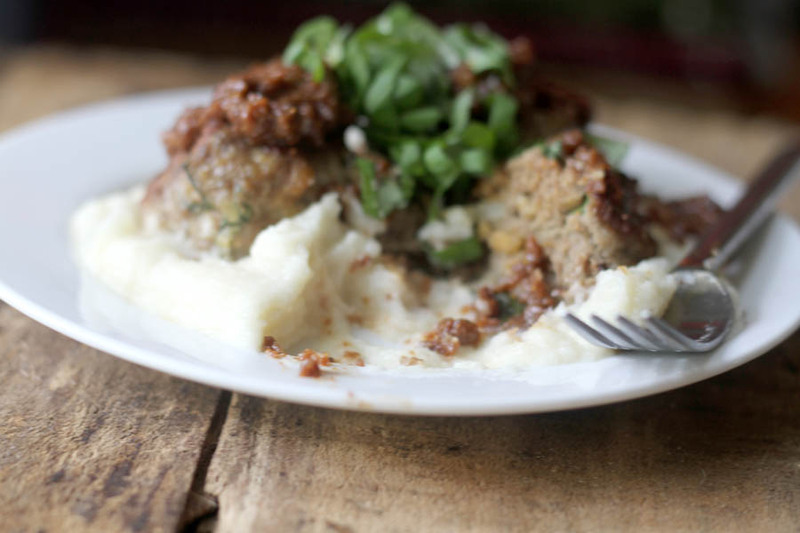 Serve with meatballs with potatoes, roasted vegetables or pureed cauliflower.